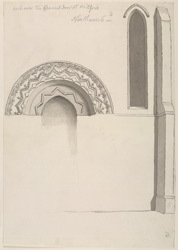 A drawing in ink of the arch over the chancel door in the Church of St Mary Magdalene in Mitford. Built in sight of Mitford Castle, the church suffered many of the same ruinations. It was damaged when King John attacked Mitford in 1216, and again when Alexander II of Scotland besieged the town in 1217. It was burned badly when the castle was destroyed by fire in 1327. As a result of this fire, the north side of the chancel has reddened masonry, where there was once an adjoining sacristy or vestry. This image shows the arch of the priest's door on the south wall of the chancel. The doorway itself dates from the 13th century, but the pointed arch is most likely a reset from a later period.